This is a wordy one, consider yourselves pre-warned! I’d booked myself in for an “HD Brows” treatment at a local salon… I’ve been wanting one of these since I first heard about them a couple of months ago and I’d finally bitten the bullet. But why the panic? Well… it wasn’t real panic, more… slight anxiety. I’ve never done anything to my brows other than (over)pluck them myself. No waxing, threading… nada. Was the beautician going to point and laugh, gasp in horror, back out of the room slowly or a combination of all three? Let’s remind ourselves of my eyebrows in their normal state shall we? There’s worse brows out there, I know… but mine could definitely benefit from a little help. The treatment involves 7 steps, which creator Nilam Patel and her team claim will help you achieve the perfect brow. Sign me up! My technician began by asking me how dark I wanted to go. I had a little wobble at this point… in my head, I was picturing Katie Price’s unflatteringly dark brows (they actually use Katie Price as a marketing tool, which nearly put me off the whole idea). I ended up expressing that I wanted a good, dark brown that stopped short of harsh but that would negate the need for brow powder if I was feeling lazy. It would have been helpful if she’d had some kind of colour/depth chart available. It’s very hard to describe something like that without visual aids. 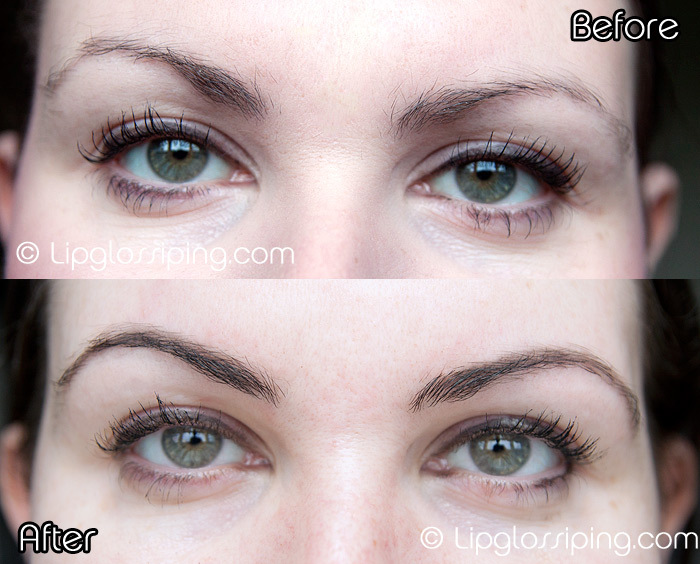 I was also expecting my technician to ask me some questions about how I wanted my brows shaped… but she didn’t! I only realised this mid-treatment as she was waxing away. My heart skipped a beat as I thought “Christ! She could be doing anything up there!” I scanned the room for Hello Kitty eyebrow stencils… thankfully there were none to be seen. After we’d come to a vague agreement on how dark I wanted to go, my technician began tinting my brows. While the dye developed, we talked about how popular the treatment was becoming. Between the HD Brow, Eyelash Extensions and Shellac nails that she offers – her books are full in the run up to Xmas! We are a vain lot aren’t we?! She wiped off the excess and left my field of vision for a moment… I jumped a little when I felt her apply warm wax to my arch… I wasn’t expecting that! Prior warning would have been good! The waxing didn’t hurt at all… I was expecting it to be a little ‘ouchie’… but no, I’d happily go so far as to call it painless. Compared to the other hair removal methods that my technician performed on me… waxing seemed to be the one she spent most time doing. She waxed under my arches, at the ends of the brows and between the brows. Threading was reserved for the top line of the brows only and tweezing just in a couple of places at the very end (this seemed to be done for precision). She commented that my brows were particularly difficult to shape thanks to their curliness! Eek! She said that I would need a good, strong brow gel and spoolie to keep them in alignment… so if anyone has any recommendations, let me know! I could see that they were a really good shape and looking far fuller than when I went in… someone had transplanted Brooke Shields eyebrows onto my face! I wasn’t delighted about the fact that the dye was still so apparent… it meant that I’d have to spend the rest of the afternoon in town with comedy brows. If this is standard practice, I don’t see the point in the 7th step of treatment… if brows are really dark from the tint residue still being on them, the last thing you want is to add to it by powdering them in with the palette! I sat in Cafe Nero, sipping my black coffee with eyebrows that matched. I’m talking this (though obviously perfectly shaped and two of them!) Mr. L was sniggering into his tea and Leila kept eyeing me suspiciously through the crumbs of her Pain au Raisin. I just kept my head down and plotted my revenge on the pair of them. I was advised not to wash the area until the next day… this was to give the tint the optimum time it needed to ‘take’. I was a little concerned that I might make them too dark by doing this but I’m a good, obedient girl and followed her advice… taking care to avoid the area when washing my face for bed. Wanna see how they turned out? I need to find out how much it costs to get them threaded and tinted locally… as if done well, this would produce the same result without the catchy “HD Brows” moniker. Maintenance (according to my therapist) is needed once a month. There’s no way I’d pay £25 a month on my eyebrows. Not a chance. So who would I recommend this HD Brow treatment for? I’d recommend it for people like me… people who don’t already have a perfect shape that they’re maintaining and who wouldn’t normally leave the house without filling in and darkening their brows. It’s a really good way to instantly transform your eyebrows and get yourself put on the right path for future maintenance. If you have a big night out or an event you need to look great for… go for it. It’s a convenient, all-in-one option. They look Gorgeous! all you need is some lash extensions and your ready to face the world makeup free! I think they look great! Much better. I have been doing beauty for 14 years now and do so many HD Brow treatments. Yes maybe £25 – £30 for a brow treatment, to some, is a lot? However I think for clients that have over plucked or want some direction its a great treatment! Also some salons like ours offer a cheaper price for clients that come back between 5/6 weeks! If you have a therapist that particularly loves doing brows and is very good at them, then maybe a tint and shape is enough. Brows are so important to your face that I can’t believe HD Brows weren’t invented years ago.